SSRIs are one of the most widely prescribed classes of medicines. Between 1999 and 2014, antidepressant use throughout the United States soared by 65 percent. Of course, SSRIs are just one antidepressant class among many. However, they remain a popular and important class. SSRIs have been around since 1987 and have, since then, become an ever more popular therapeutic means to tackle depression. SSRIs are not indicated for depression-en-masse. In other words, they are not prescribed – or should not be prescribed – for mild depression; depression that could otherwise be treated through talking therapies or lifestyle amendments. Instead, SSRIs are indicated as first-line treatment for moderate-to-severe depression – in cases where talking therapies, such as cognitive behavioral therapy (CBT) and lifestyle changes, have proven either insufficient or ineffective. Panic disorder – A further subset of anxiety disorders. Obsessive-compulsive disorder (OCD) – a condition in which patients feel the need to reassure themselves by irrationally and repetitively checking thoughts and actions. SSRIs may also be used to treat other indications not listed in this guide. How do SSRIs work though? SSRIs pharmacology is all in the name – they are “selective serotonin reuptake inhibitors”. Serotonin is also known as 5-hydroxytryptamine (5-HT). Neurotransmitters – such as serotonin and norepinephrine – must pass from one neuron to another. A gap exists between both neurons – a space known as the synaptic cleft. When serotonin passes from the first neuron (the “presynaptic cell”) into the synaptic cleft, it traverses that gap to arrive at the surface of the second neuron (the “postsynaptic cell”). The postsynaptic cell contains receptors on its surface that bind serotonin. Upon binding to the receptor, the neurotransmitter can exert its effect and stimulate those effects throughout the brain. However, not all serotonin binds to these receptors. As a result, most serotonin lingers in the synaptic cleft, going unused. Transporters – called monoamine transporters – shuttle up to and carriage any remaining serotonin, returning it to the host presynaptic cell. SSRIs interfere with this process, meaning that more serotonin lingers in the synaptic cleft and binds to postsynaptic cell receptors – stimulating those receptors more than it otherwise would. Chronic use of SSRIs leads to reduced serotonin production by the presynaptic cell. In turn, this leads to downregulation of postsynaptic receptors. However, the precise mechanism by which this process produces an “antidepressant” effect is currently unknown. Because serotonin is associated with feelings of well-being and happiness, increased serotonin presence within the synaptic cleft is believed to augment this positive emotional response. Selective serotonin reuptake inhibitors prevent “reuptake” of serotonin back to the presynaptic cell. As a result, more serotonin remains within the synaptic cleft. Serotonin now has greater probability of binding to and stimulating postsynaptic cell receptors. With chronic use, SSRIs lead to reduces serotonin production by the presynaptic cell and downregulation of receptors on the postsynaptic cell. More serotonergic stimulation is linked with more happiness and greater sense of well-being. With this mechanism in mind, let’s review the primary side effects associated with SSRIs. SSRIs are associated with their own range of potential side effects. Some SSRIs – such as citalopram – prolong the QT interval. SSRIs lower the seizure threshold. SSRIs are also linked to a higher incidence of bone fractures, skin rash and photosensitivity. If administered alongside anticoagulants and/or NSAIDs, SSRIs increase the risk of gastrointestinal bleeding. Abrupt discontinuation from SSRIs is linked to nausea, headache, gastrointestinal effects, sleep disturbance, dizziness and flu-like symptoms. Discontinuation of SSRIs should take place over at least a one-month period. That the risk of serotonin syndrome increases when SSRIs are taken with medicines (see above) that augment serotonergic effects. That SSRIs should be used with caution in patients liable to experience more adverse effects – patients with epilepsy or peptic ulcer disease, or in patients who take NSAIDs or anticoagulant medicines (increasing risk of bleeding). That dose reduction is required in patients with hepatic dysfunction. That SSRIs should be avoided in patients taking medicines that prolong the QT interval; including many antipsychotic medicines. That suicidal ideation remains a higher risk in younger patients – both children and adolescents. That SSRIs are safer in overdose when compared to other antidepressant drugs, such as TCAs. Citalopram has the greatest risk in toxicity, as it’s associated with QT prolongation, whereas fluoxetine is associated with the lowest risk. That SSRIs are typically started at a lower dose and, when necessary, titrated up to the desired dose. Similarly, abrupt withdrawal should be avoided. Dose should be reduced slowly over at least a one-month period. Even though the precise mechanism between SSRIs and therapeutic effect remains unknown, SSRIs are widely prescribed and are – at present – associated with an improvement in symptoms compared to placebo (particularly when taken alongside talking therapies, such as CBT). For this reason, they remain an important antidepressant pillar in the wider treatment of depression and anxiety disorders. Want to test your knowledge of SSRIs? 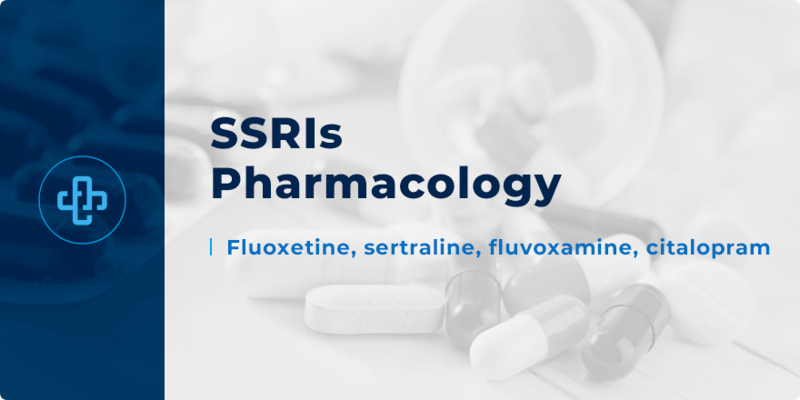 Register with PharmaFactz today to learn more about SSRIs pharmacology. In the meantime, take a few seconds to join our pharmacy blog newsletter (above) to receive all the latest facts direct to your email!